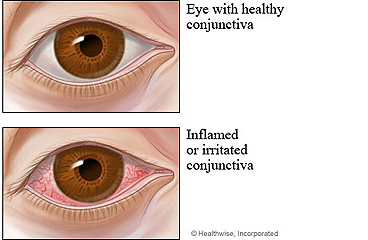 Allergic conjunctivitis (say "kun-JUNK-tih-VY-tus") is an eye problem that many children get. It is often called pink eye. In pink eye, the lining of the eyelid and the eye surface become red and swollen. The lining is called the conjunctiva (say "kawn-junk-TY-vuh"). Pink eye can be caused by bacteria, a virus, or an allergy. Your child's pink eye is caused by an allergy. A substance (allergen) triggers a reaction that results in the symptoms. This type of pink eye cannot be spread from person to person. Your child may have other symptoms of an allergy, such as a runny nose. Allergic pink eye goes away when you keep your child away from the allergen that triggers the pink eye. Triggers include pollen, mould, and animal skin cells (dander). But because it is not always possible to stay away from triggers, your doctor may suggest eyedrops to treat the symptoms. Antibiotics do not help with allergies. Have your child take medicines exactly as prescribed. Call your doctor or nurse call line if you think your child is having a problem with his or her medicine. You will get more details on the specific medicines your doctor prescribes. Tilt your child's head back and pull his or her lower eyelid down with one finger. Drop or squirt the medicine inside the lower lid. Have your child close the eye for 30 to 60 seconds to let the drops move around. Do not touch the tip of the bottle to your child's eyelashes or any other surface. Use moist cotton or a clean, wet cloth to remove the crust from your child's eyes. Wipe from the inside corner of the eye to the outside. Use a clean part of the cloth for each wipe. Put cold or warm wet cloths on your child's eyes a few times a day if the eyes hurt or are itching. Do not have your child wear contact lenses until the pink eye is gone. Clean the contacts and storage case. If your child wears disposable contacts, get out a new pair when the eyes have cleared and it is safe to wear contacts again. Control animal dander and other pet allergens by keeping pets only in certain areas of your home. Avoid outdoor pollens by keeping your child inside while pollen counts are high. Control indoor mould by cleaning bathtubs and showers monthly. Your child has pain in an eye, not just irritation on the surface. Your child has a change in vision or a loss of vision. Pink eye lasts longer than 7 days. Enter N976 in the search box to learn more about "Allergic Conjunctivitis in Children: Care Instructions".